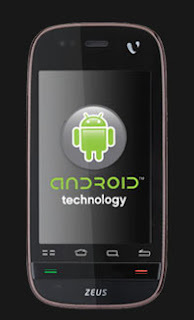 The Evolve (Zeus) is quite similar to Spice’s Android off ering, with a few diff erences. For one, it comes off as far more elegant. The specs are almost identical though; a 3.2-inch capacitive touchscreen (320x480) with multi-touch, a concealed micro USB port, and a hot swap microSD card slot (8 GB card included). 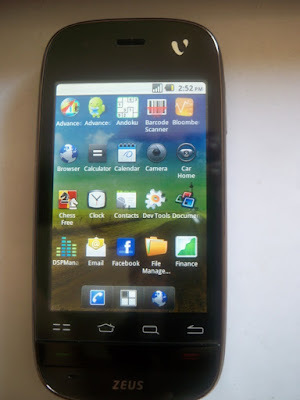 Videocon has adopted the same gaudy UI as the Mi-300. The icons are oversized and a little too colorful. The UI is smooth, responsive and easy to navigate. Audio volume was loud enough and quality is quite decent too, but the lack of FM radio is a stinger. The Zeus handles iPhone MP4 videos and 3GP fi les with ease. It’s a 3.5G handset, with EDGE/GPRS for us non-3G countries. Wi-Fi, Bluetooth with A2DP and GPS with Google Maps are all present. Gtalk and YouTube apps are included too, but a Facebook app is missing. The Zeus also comes with a 5-megapixel autofocus camera. Image quality isn’t anything spectacular, and in bright sunlight, certain brighter colors get over-exposed. On one charge, the Zeus is good for a little over a day and a half, with about 3 hours of talk time. The Zeus’ design makes it worth the Rs 12,500 MOP, but if you’re looking for an Android handset on a low budget, the Samsung Galaxy 3 is the best choice.